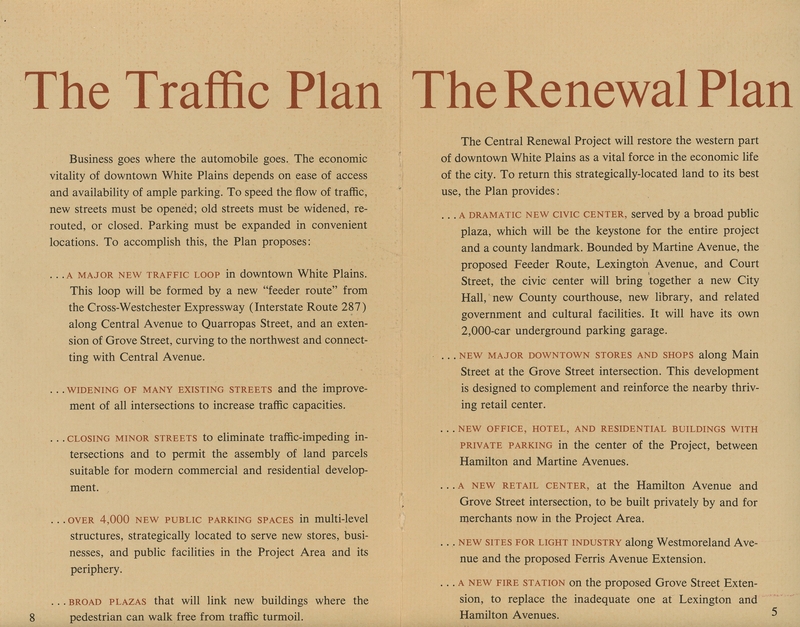 The Urban Renewal Collection is a set of documents, photographs, newspaper clippings, and publications that tell part of the story of urban renewal in White Plains between the mid-1950s and the late-1970s. All of the information in this post is drawn from sources in that collection and the White Plains Collection more broadly. 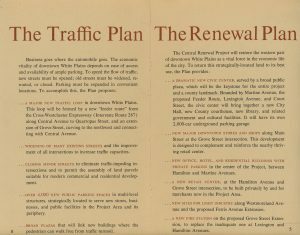 In White Plains we throw around the phrase “urban renewal” rather casually, but it actually first referred to a specific set of laws, projects, and changes. The phrase “urban renewal” was codified in the Housing Act of 1954. Ironically, the Housing Act of 1954 actually increased the amount of funds that could be applied to non-residential construction in urban renewal projects. Thus began one of the largest per-capita urban renewal projects in the country. In 1955, the City Planning Board began a study of areas and uses for an urban renewal project in White Plains. Politicians and people across America began using words like “renewal,” “redevelopment,” and “revitalization” to convey their optimism about the improvements that could be realized from federally funded projects. Their progressive, democratic tone belied a more autocratic reality. Cities and their residents, especially mayors and other officials, found it hard to look away from the prospect of funding projects with ample state and federal funds. Many projects progressed without the sort of consensus support one might expect for projects that included generous use of eminent domain by the government and forced many people to leave their homes. 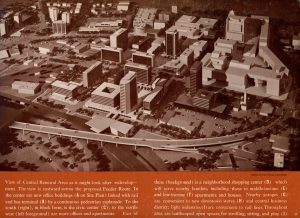 In White Plains, urban renewal progressed at a typically slow bureaucratic pace, delaying any sense of imminent change until it was too late for people opposed to the project to leverage residents' urgent concerns into any form of effective political resistance. The Mayor’s Reports of 1956 and 1957 record that committees were created and surveys were “made quietly” while the Common Council “informally” authorized the hiring of a consultant. 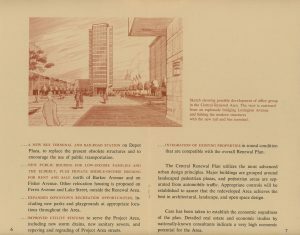 In June 1959, it was announced that the official Urban Renewal Area would comprise everything between Mamaroneck Avenue and the train station, and between Fisher Avenue and Mott Street. In 1961, six years after beginning to seek funds for a project, a preliminary plan was made public. Many of these plans and maps are available in the library’s collection. 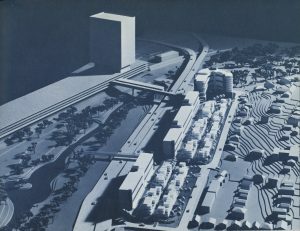 In 1962, a second project was proposed for Lake Street that included on-site housing for residents whose homes would be demolished during the project. 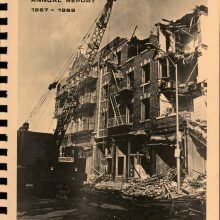 In 1966, the first major demolitions and buying of property began. With this activity came the biggest effects on White Plains’ lower-cost housing stock. Swaths of the downtown area between Winbrook and Main Street were purchased by the city. To offset the loss of a good portion of the city's lower-cost housing, the city initiated building affordable housing at other sites. The first families moved into Summit House on Ferris Avenue and ground was broken on a Lake Street site for housing in 1966. The same year, the Public Housing Administration approved preliminary plans for 167 units of public housing on the Schuyler-DeKalb site and the city purchased an existing building on the fringe of the renewal area for senior housing. Three things strike me about this period of time in White Plains’ history. First, time itself. It took over ten years for urban renewal, as we understand it, to go from idea to execution. It was an incredibly long process that, nonetheless, proceeded effectively. Second, the fact that early decisions about whether or not White Plains would undertake urban renewal projects were made, in the mayor’s own words, “quietly” and “informally” is significant. Such large projects that affected literally every single resident would seem to require the knowledge and consent of a majority of people, but no effort to obtain popular consent seems to have been made by the city’s officials in these early days. It was enough that they had been elected, and even if they had been elected before urban renewal was a phrase that held meaning for most people, elected officials and civil servants pushing for urban renewal the city assumed their actions would do the most good for the most people. During interviews for the People & Stories Oral History Project, I asked many people about their impressions of the urban renewal process in White Plains. Naturally, some people had stronger impressions than others. People who lived in the Highlands or along North Street didn’t mention as strong of an effect on their daily life as people who grew up or lived in the downtown area. Absent are the voices of those who moved away from White Plains. For all the differences in how people recall their experience of urban renewal in White Plains, there is one common thread: a sense of inevitability. When asked whether there was a chance to influence the course of projects or if they remember voices raised in protest, people said things like “A lot of people had to move,” or “It was just what was happening.” And while some, like the AME Zion church, were able to find new homes, others simply left. Illustration from a booklet proposing a large project in Battle Hill. The cars in the illustration are running along Tarrytown Road (which had been turned into the Northern Arterial in the plan) and the Bronx River can be seen on the left. An illustration from a 1963 booklet imagining what the Central Renewal Area might look like in the future. The area shown comprises almost all of downtown White Plains, specifically the areas currently occupied by the Galleria and the Library Plaza. By the late 1960s and early 1970s, the human and physical geography of White Plains was permanently changed. The historical downtown was demolished, graded, dugout, drained, pile-driven, and rebuilt–first into towering concrete and re-bar skeletons, then into imposing manifestations of a modernist urban aesthetic at complete odds with the previous character of the city. The architecture of urban renewal and public housing was not concerned with creating mixed-use, pedestrian-friendly spaces. Plans for the city were often grandiose (though almost always became more modest) and focused on creating buildings for government offices, courts, and, it was hoped, private businesses. By offering this extremely brief overview (and I assure you there are details, nuances, and exceptions to be found in all that I have described), we come to roughly the 1980s. What happened at this point is a story for another post. Needless to say, valuable perspectives can be developed by examining the history of urban renewal in White Plains. 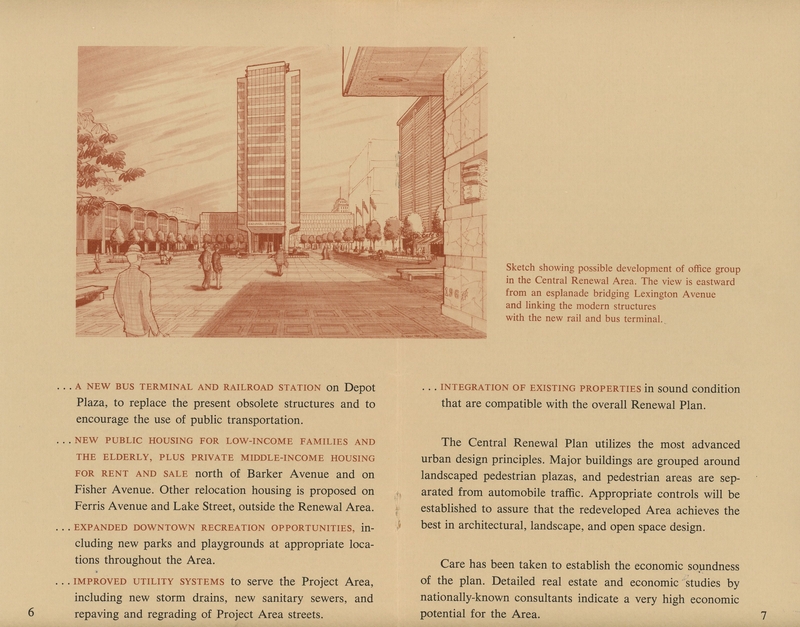 The featured image in the top left of the post is the cover of the Urban Renewal Agency's 1967-1968 Annual Report.